A surprise trip to Barcelona with her boyfriend, Jake, seems like the perfect antidote to Grace Sawyer’s current woes. The city is dazzling and unpredictable, but the biggest surprise for Grace is discovering who arranged and paid for the vacation. Carrie Ann wasn’t just Grace’s foster sister. Clever, pretty, and mercurial, she was her best friend—until everything went terribly wrong. Now, as she flees an abusive marriage, Carrie Ann has turned to the one person she hopes will come through for her. Despite her initial misgivings, Grace wants to help. But then Carrie Ann and Jake both go missing. Stunned and confused, Grace begins to realize how much of herself she’s kept from Jake—and how much of Carrie Ann she never understood. Soon Grace is baited into following a trail of scant clues across Spain, determined to find the truth, even if she must revisit her troubled past to do it. Mary Carter’s intriguing novel delves into the complexities of childhood bonds, the corrosive weight of guilt and blame, and all the ways we try—and often fail—to truly know the ones we love. 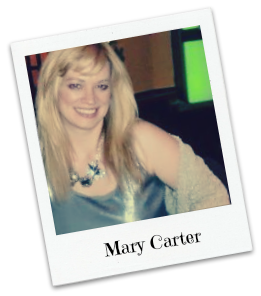 Mary Carter is a freelance writer and novelist. Meet Me in Barcelona is her eighth novel. Her other works include: Three Months in Florence, The Things I Do For You, The Pub Across the Pond, My Sister’s Voice, Sunnyside Blues, She’ll Take It, and Accidentally Engaged. In addition to her novels she has written six novellas: “Return to Hampton Beach” in the anthology, Summer Days, “A Southern Christmas” in the upcoming 2014 anthology Our First Christmas, “A Kiss Before Midnight” in the anthology, You’re Still the One, “A Very Maui Christmas” in the New York Times best selling anthology Holiday Magic, and “The Honeymoon House” in the New York Times best selling anthology Almost Home. Mary currently lives in Chicago, IL with a demanding labradoodle. She wishes she could thank her gorgeous husband, but she doesn’t have one. In addition to writing she leads writing workshops. 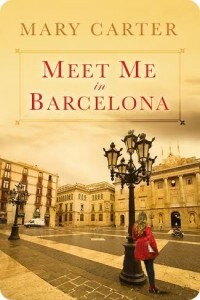 I was expecting Meet Me in Barcelona to be kind of fluffy (not in a bad way), and light, skirting the line between romance and contemporary women’s fiction, and I would have enjoyed it if that’s what it had been. Instead, I was treated to something even better: a study of the dynamics of aging, of relationships, and of what defines family. Protagonist Grace could have been me or any of my friends at thirty. Reasonably stable in work and her relationship, watching her parents diminishing before her eyes, and trying to balance the need to provide care, with the equally important need of self care. Carrie Ann is a true sister, just not one of blood, and watching both women work through their issues is an exercise in the patience and love we should all have,a as well as an acknowledgement that no one is perfect, and everyone deserves a second chance. Grace’s boyfriend Jake is, in many ways, the perfect boyfriend – employed, loyal, loving, and driven to help Grace integrate past hurts into her present life in order to work through them, and come out on the other side. In any other novel, this would be a love triangle. Instead, it becomes the base of a strong pyramid, and Barcelona becomes as much a character as a setting in the novel, enhancing every aspect of the story. This novel has something for everyone: romance, intrigue, pathos, and family bonding, and it’s all wrapped up in Mary Carter’s delicious prose. It’s a great Sunday afternoon with a pot of tea novel. It’s a great reading in the bath novel. It’s a great novel. Period. Goes well with Paella and a really good craft beer. This review is part of a blog tour hosted by Pump Up Your Book. For more information, including a raffle and the complete list of tour stops, click HERE.